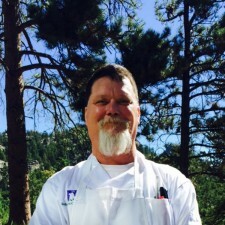 Ed is one of ourchef/instructors. He is responsible for supervising student KP teams in meal preparation and cleanup. Ed has been professionally cooking and running kitchens for more than 40 years. He has also owned and operated two food-related businesses. Ed lives in Loveland with his wife, Anneke, and four of his six children. The other two children are college graduates who live in Massachusetts and Washington State. My favorite thing about Eagle Rock is working with teens. I really love cooking for an appreciative audience.